The book aims to encourage readers to reflect on their professional teaching practice, drawing on a range of models and techniques. It discusses a range of approaches to reflective practice, contextualising these to the classroom and discussing ways in which the effectiveness of reflection can be enhanced. It goes on to discuss ways in which reflective practice can improve the achievements of staff and students. The book is approachable and engaging, containing a range of case studies and examples from practice in primary schools and Initial Teacher Education, together with a range of useful resources and tools. College Lead for Partnerships: College of Law Humanities and Social Sciences. Ghaye, T. (2011) Teaching and Learning Through Reflective Practice: A Practical Guide for Positive Action. 2nd Edition. Oxen Routledge. Kolb, D.A. (2014) Experiential Learning: Experience as the Source of Learning and Development. Pearson Education. Moon, J. (1999) Reflection in Learning and Professional Development. Kogan Page. Raelin, J. A. (2008) Work Based Learning: Bridging Knowledge and Action in the Workplace. – Chapter 7. San Francisco, Wiley. Rolfe, G., Freshwater, D. and Jasper, M (2001) Critical reflection in Nursing and the Helping Professions: A User’s Guide. Basingstoke, Palgrave Macmillan. Schon, D. (1983) The Reflective Practitioner: how professionals think in action. London : Temple Smith. As the author(s), the AJPP wishes you to retain the right to place the article on your personal Web page or that of your university or institution. 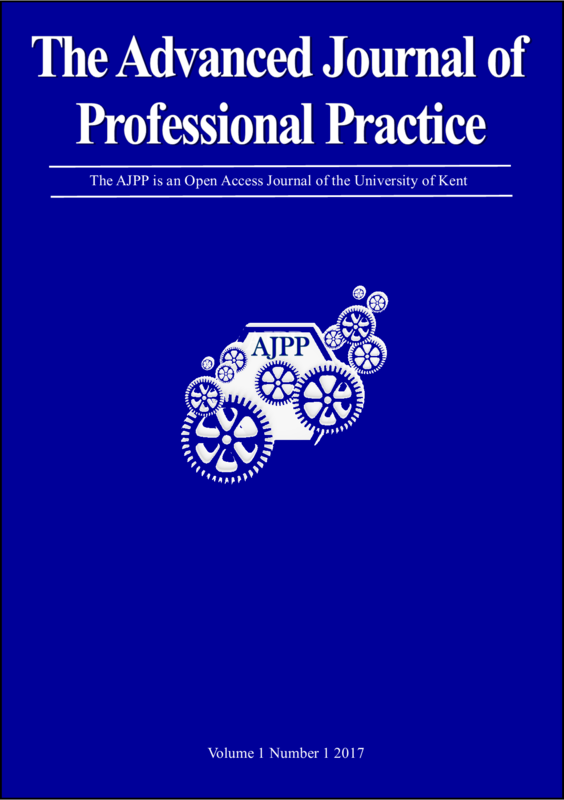 The AJPP askes that you include this notice: A fully edited, peer-reviewed version of this article was first published by the Advanced Journal of Professional Practice, <Year>, <Volume>, <Issue>, <Page Numbers>. You retain the right to unrestricted use of your paper for yourself or for your own teaching purposes. BY AGREEING TO THE FOREGOING, YOU CONFIRM THAT THE MANUSCRIPT YOU ARE SUBMITTING HAS NOT BEEN PUBLISHED ELSEWHERE IN WHOLE OR IN PART, AND THAT NO AGREEMENT TO PUBLISH IS OUTSTANDING. SHOULD THE ARTICLE CONTAIN MATERIAL WHICH REQUIRES WRITTEN PERMISSION FOR INCLUSION, YOU AGREE THAT IT IS YOUR OBLIGATION IN LAW TO IDENTIFY SUCH MATERIAL TO THE EDITOR OF THE AJPP AND TO OBTAIN SUCH PERMISSION. THE AJPP WILL NOT PAY ANY PERMISSION FEES. SHOULD THE AJPP BE OF THE OPINION THAT SUCH PERMISSION IS NECESSARY, IT WILL REQUIRE YOU TO PURSUE SUCH PERMISSSION PRIOR TO PUBLICATION. AS AUTHOR(S), YOU WARRANT THAT THE ARTICLE BEING SUBMITTED IS ORIGINAL TO YOU. Provided the foregoing terms are satisfactory, and that you are in agreement with them, please indicate your acceptance by checking the appropriate box and proceed with your submission.